Is David Cameron our prime minister, or just a travelling arms merchant? This weekend a coterie of British businessmen including the arms dealer Rolls-Royce were jetted around Kazakhstan on board the private plane of its dictator Nursultan Nazarbayev, who has ruled the large Asian republic for 23 years by filtering oil revenues into his private bank account and cracking down on dissent. Why are British businesses allowed be so cosy to such brutal men? Because our head of government, David Cameron, was on the plane with them. A good job for them that Cameron was there to defend their rights? Not so. Nothing shows David Cameron to be a hypocrite on human rights, freedom and democracy quite as well as looking at his passport. In 1989, while Nelson Mandela was still imprisoned on Robben Island, a 23-year-old David Cameron took an all-expenses-paid trip to South Africa funded by a firm that lobbied against sanctions. This was when Cameron learned his politics from Thatcher’s government, who sold weapons to the murderous General Suharto of Indonesia and even wasted £1bn propping up Saddam Hussein in Iraq. The morality of Conservative foreign policy has not shifted with the return of Thatcherism in the form of Cameron himself. Shortly before intervening in Libya, Cameron was caught on a plane full of arms dealers desperate to sell their wares to Colonel Gaddafi. Whilst the Libyan intervention might be justifiable on humanitarian grounds, Cameron’s loyalties before it were plain to see: to the corporations who keep him in their pocket. By revoking the export licenses to Libya after the uprising started, Cameron was admitting Britain had been in the wrong arming the regime in the first place. The man is nothing if not consistent. Arabs who took to the streets demanding democratic reforms in Egypt and Bahrain were met with British tear gas, probably secured on one of Cameron’s many arms dealing trips around the Gulf. These included “CS hand grenades, demolition charges, smoke canisters and thunderflashes”. This trail of guns and gold that Cameron has left in the Gulf’s sand is justified as a necessary sacrifice to be offered at the altar of ‘British trade interests’, a handy catch-all which neatly fails to mention there are moral limits to what markets can sell. If divestment and boycott of South Africa to end apartheid trumped British trade interests in the 1980s, then the principle still applies now, although it is clear David Cameron was not convinced of it back then either. 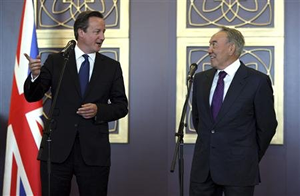 From South Africa, to the Gulf and now to Kazakhstan, Cameron’s allegiance has been to profit, not people. As a free-market ideologue leading a Thatcherite party, David Cameron is not inclined to accept that regulation is often needed to temper the market, including bans on arms sales to certain regimes. There is clearly a need for a re-think. By linking future trade deals to improvements in human rights, Britain can have a genuinely progressive foreign policy. The current arms free-for-all is an obstacle to democracy. Nor does it aid British workers. Only 0.2 per cent of jobs in the arms industry itself are dependent on exports, and the industry enjoys a £700m state subsidy that could create far more jobs in a socially useful sector. When Cameron is signing trade deals with foreign dictatorships it should be in exchange for guarantees of human rights, and when those deals are signed with some of the most repressive regimes in the world, it should never be for weapons. He should behave as if he were a responsible, progressive prime minister, not a cynical merchant and cipher for special interests. Of course, all the arms dealing stopped when the Red Tories were in power. Whilst I agree with all that. He always looked to me like a second hand car salesman and I guess selling guns isn’t that much different, especially selling them to people who really want them, but I think it is only fair to mention that Gordon Brown didn’t exactly have a clean record on this front. Come to that neither did Tony Blair, quite apart from his Neo-Con war in Iraq. They are all, every bit as bad as each other… and the Labour men in particular, profess Christianity driving their every move. At least Cameron is lukewarm on his Christianity, confining himself to telling us that we are a Christian country… like a country can have a belief.